Catherynne M Valente did her own unique take on fantasy in her Fairyland series and produced the wildly original science fictional movie industry homage Radiance a couple of years ago. Now she takes on the Eurovision Song Contest in a Douglas Adams-inspired galactic romp. For Australians, who have embraced Eurovision and its stars, the idea of a bunch of countries getting together in a competition of glitz, glamour and pop music as opposed to, say fighting each other, is probably not all that out there. Americans, whose diplomacy has tended to be a bit more po-faced might find this concept a little harder to swallow. One day every person on Earth is contacted by an alien race. They are told not only that they are not alone in the universe but that in order to join the club of sentient races, humanity has to compete and not come last in Megagalactic Grand Prix. The Grand Prix was instituted as a way of resolving the long running and destructive Sentience Wars. For Australians, now competing at Eurovision but constantly having to put up with the accusation that Australia is not in Europe, this plot line has more than a little resonance. Anyway, the only act that humanity’s sponsors want whose members are not dead is a now defunct glam rock band called Decibel Jones and the Absolute Zeroes. The two remaining members of that band are summarily whisked away to perform for the future of humankind on a distant planet. 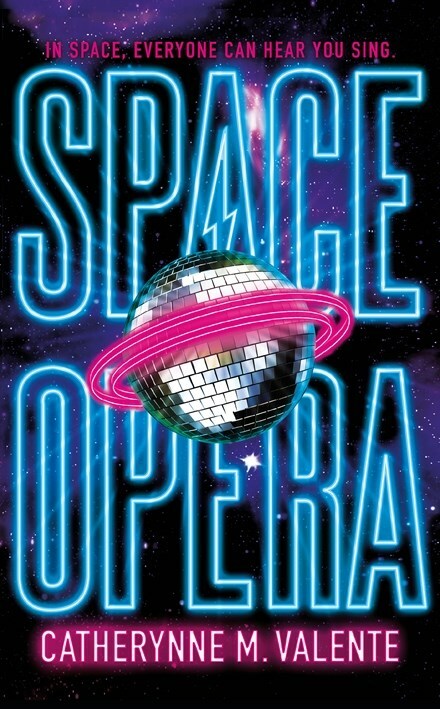 Space Opera is Valente’s broadly successful attempt to channel Douglas Adams. To that end there is bit of a loser protagonist and scant plot but plenty of amusing, sometimes pointed digressions that riff on a range of science fiction standards. Much like Eurovision itself, the whole thing goes on a little too long and is ultimately fairly predictable. But in the spirit of Eurovision there is so much distracting literary pyrotechnics, good humour and love in the air (for the event itself, its fans and the type of people who perform in it), that its failings can easily be forgiven.